48 W INTER 2019 PracticeLink.com features school. They were trying to help save lives by bringing telemedicine to rural areas where intensive care resources were scarce. I said to them, 'You need MBAs to take this thing and make it big.' They both enrolled while still practicing and building their venture. It's hard, but if you're motivated enough, you can do it. Knowing why you're doing it— to achieve a goal, to learn a new set of skills — can make it easier to stay focused." 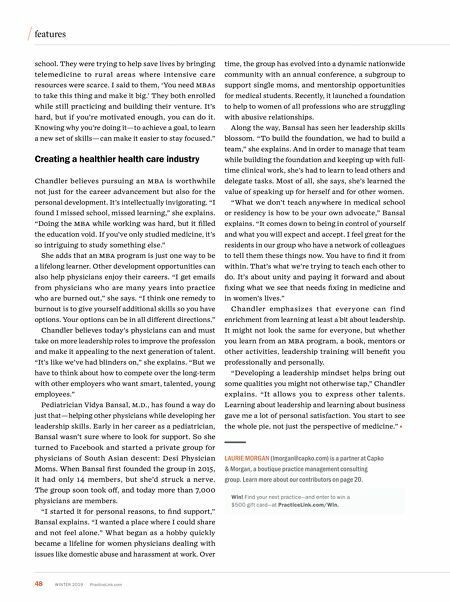 Creating a healthier health care industry Chandler believes pursuing an MBA is worthwhile not just for the career advancement but also for the personal development. It's intellectually invigorating. "I found I missed school, missed learning," she explains. "Doing the MBA while working was hard, but it filled the education void. If you've only studied medicine, it's so intriguing to study something else." She adds that an MBA program is just one way to be a lifelong learner. 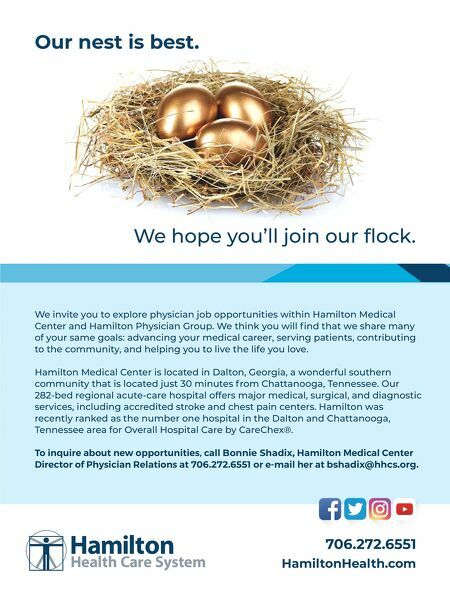 Other development opportunities can also help physicians enjoy their careers. "I get emails from physicians who are many years into practice who are burned out," she says. "I think one remedy to burnout is to give yourself additional skills so you have options. Your options can be in all different directions." Chandler believes today's physicians can and must take on more leadership roles to improve the profession and make it appealing to the next generation of talent. "It's like we've had blinders on," she explains. "But we have to think about how to compete over the long-term with other employers who want smart, talented, young employees." Pediatrician Vidya Bansal, M.D., has found a way do just that— helping other physicians while developing her leadership skills. Early in her career as a pediatrician, Bansal wasn't sure where to look for support. So she turned to Facebook and started a private group for physicians of South Asian descent: Desi Physician Moms. When Bansal first founded the group in 2015, it had only 14 members, but she'd struck a nerve. The group soon took off, and today more than 7,000 physicians are members. "I started it for personal reasons, to find support," Bansal explains. "I wanted a place where I could share and not feel alone." What began as a hobby quickly became a lifeline for women physicians dealing with issues like domestic abuse and harassment at work. Over time, the group has evolved into a dynamic nationwide community with an annual conference, a subgroup to support single moms, and mentorship opportunities for medical students. Recently, it launched a foundation to help to women of all professions who are struggling with abusive relationships. Along the way, Bansal has seen her leadership skills blossom. "To build the foundation, we had to build a team," she explains. And in order to manage that team while building the foundation and keeping up with full- time clinical work, she's had to learn to lead others and delegate tasks. Most of all, she says, she's learned the value of speaking up for herself and for other women. "What we don't teach anywhere in medical school or residency is how to be your own advocate," Bansal explains. "It comes down to being in control of yourself and what you will expect and accept. I feel great for the residents in our group who have a network of colleagues to tell them these things now. You have to find it from within. That's what we're trying to teach each other to do. It's about unity and paying it forward and about fixing what we see that needs fixing in medicine and in women's lives." Chandler emphasizes that everyone can find enrichment from learning at least a bit about leadership. It might not look the same for everyone, but whether you learn from an MBA program, a book, mentors or other activities, leadership training will benefit you professionally and personally. "Developing a leadership mindset helps bring out some qualities you might not otherwise tap," Chandler explains. "It allows you to express other talents. Learning about leadership and learning about business gave me a lot of personal satisfaction. You start to see the whole pie, not just the perspective of medicine." LAURIE MORGAN (lmorgan@capko.com) is a partner at Capko & Morgan, a boutique practice management consulting group. Learn more about our contributors on page 20. Win! Find your next practice—and enter to win a $500 gift card—at PracticeLink.com/Win.